Snickers has done an incredible job with the You’re Not You When You’re Hungry campaign. I think it’s a shining example of integrated marketing communication. 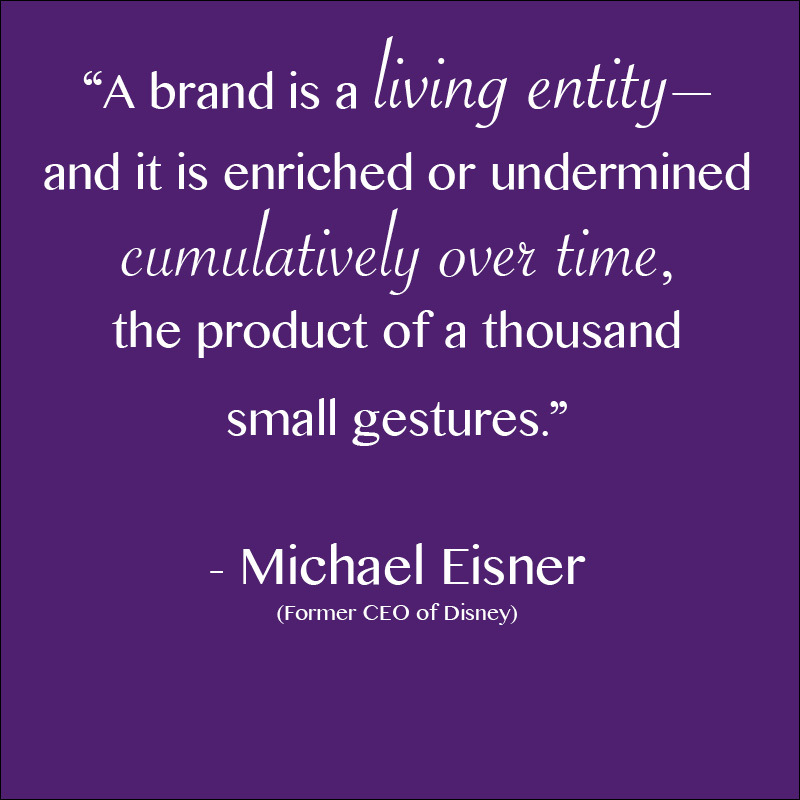 Most importantly, the success of this campaign stems from an authentic expansion of their brand. Snickers has positioned themselves as a solution for being hungry. They are building off of their “hungry, why wait?” campaign and focusing on Snickers being a delicious treat to alleviate hunger. What I really liked about the Snickers campaign was that it gave customers engaging content that was tailored to the platforms Snickers selected. Let’s take a quick look at how Snickers has expended their messaging across a few different platforms. Print advertising: In their print ads, Snickers focused on showing regular, every day people doing things that were uncharacteristic for the activity they were performing. The ad below shows individuals that are unable to focus on the task at hand. These normal activities have become difficult and unmanageable because they’re hungry. Television advertising: Many of us have seen the Snickers ads featuring Betty White and Joe Pesci portraying individuals who are, again, acting uncharacteristically because they are hungry. This idea furthers the central message of the campaign, but tailors the message so it enhances the medium. The addition of sound and motion means that simply recycling the print ads wouldn’t work. Super Bowl Ad: In keeping with their celebrity theme, Snickers cast 70 year-old Danny Trejo to play Marcia Brady. The Washington Post considered it one of the best commercials of the game. Prior to releasing the Super Bowl spot, Snickers had a portrait of Marcia Brady painted on a building with the tag line #Whats UpWithMarcia. Over the course of a few weeks, the painters transformed the photo from Marcia to Danny Trejo. Recently, Snickers created a video of the building being painted as a kick off to their new U.S. promotion. According to AdWeek, customers can go to EatA.Snickers.com and post photos and videos of who they are when they’re hungry for a chance to win prizes. Guerilla Marketing: This is probably my favorite tactic. Snickers put a photo booth on the street in Brazil. Customers entered the photo booth, had their photos taken, and then picked them up as the exited the photo booth. When they looked at the photos they were photos of other people. Again…furthering the message that you’re not you when you’re hungry. According to the 2011 Effie Awards, in the first three months of the campaign, Snickers saw global growth. In the United States alone sales volume increased 8% and single sales rose by 13.4%. Additionally, the year-on-year household penetration rose 1.8 percentage points after previously declining by 1.6. Snickers seems to have found the prefect recipe for IMC. 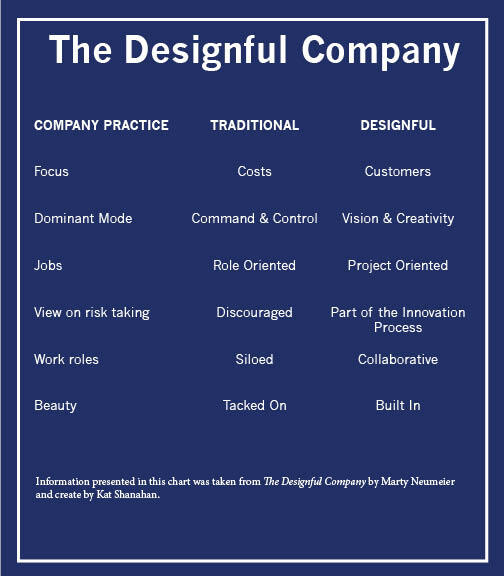 They started with an idea that was central to their core values and then they tailored each message to the medium they needed. What other campaigns have you seen that resonate with you? If there’s one thing that I’ve realized since enrolling in the WVU IMC program it’s that IMC is most effective when it runs through the veins of an organization. I hope this series of posts will help you gain buy-in for your marketing efforts across you organization and I hope that you’ll comment and share what is working for you, or what you’re having trouble with. You can gain a great deal of information from Web metrics and there are many ways in which Web metrics can be used “outside the marketing department.” I wanted to share two things that worked for our organization and encourage you to share your stories. The ID card office on our campus was faced with a challenge. They had the opportunity to develop a smartphone app, but didn’t know which one would be the best choice for the initial launch. When we got together with the department we discussed the possibility of doing a survey. A simple smartphone poll on Facebook would have provided us with preliminary information to make our decision. We have had success with surveys on campus, but we didn’t want to over-survey our audience. As a solution to the issue, we analyzed the Google Analytics of our overall Web site and the pages that are specifically dedicated to the ID card office. From the information provided in Google Analytics we could see the numbers of viewers that accessed our content on an iPhone or Andriod phone. Using Google Analytics was faster, easier, and provided more information than a survey. Using Google Analytics helped us show the ID card office the importance of Web metrics, which helped gain support for further evaluating other marketing initiatives including paid advertising. Again, the ID card office wanted to measure the success of a paid ad that was on the cover of a local publication. We created a unique URL in order to track the traffic. We knew it was not a perfect solution, but we also knew that it would help guide the advertising efforts of the office. The result: There were only two hits on the unique URL. That doesn’t measure awareness of the ad, but it does measure action. Implementing IMC in your organization can be very challenging. What have you found that helps you take Web analytics “outside” the marketing department and further into the organization? Looks out for the little guy – The median lifespan of a Tweet is approximately 18 minutes. 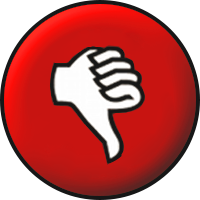 It is absolutely unrealistic to read every Tweet that flitters across your stream. Lists help organize content so that you have an easier time seeing content from people who Tweet less than every 18 minutes. 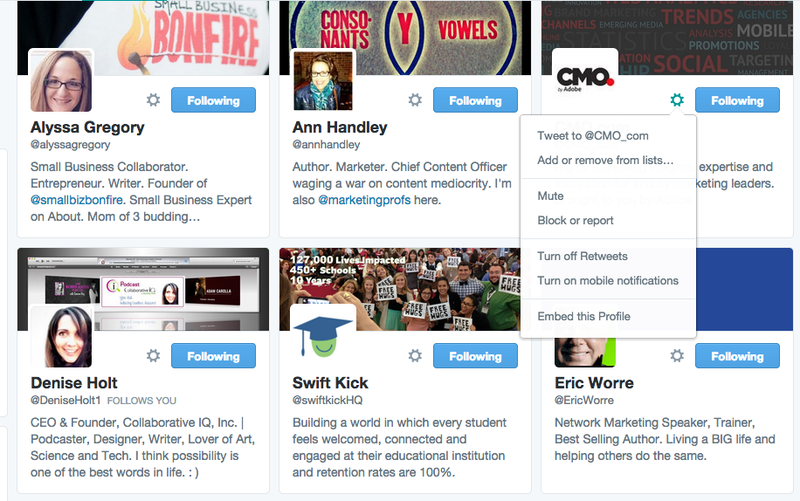 Helps you find good content – A great feature of Twitter lists is that you can subscribe to lists other people make. Subscribing to the lists that your trusted contacts create helps you find more valuable people to follow. 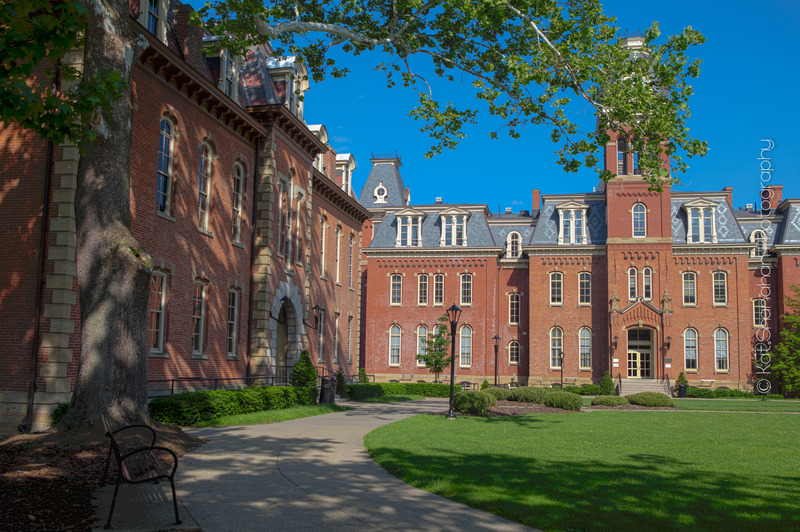 Here’s a great WVU IMC list by Thomas Armitage. Organizes the people you follow – If you’re like me, you’re constantly looking for Twitter accounts that share valuable information. I often see articles that featuring the top 50 people to follow for this reason or that reason, but after I follow them I forget why I did. Organizing the people you follow by content area allows you to easily remember why you’re following someone and what content they bring to the table. Bridges online and in-person relationships – You can also create Twitter lists for conferences that you’ve attended so that you can better manage how and where you meet people off-line. I have a list of Higher Education colleagues that I’ve meet through various conferences and events. Helps with Twitter chats – Twitter chats are a great way to build relationships online and learn more about a particular topic. Twitter lists can help organize contacts so that when you’re participating in Twitter chats it’s easier to filter information. You’re never going to keep up with ALL the Tweets, but lists can help make the content more digestible and less overwhelming. I will admit Twitter doesn’t necessarily make it easy to build lists. I had to go through all of the people I was following and add them to lists individually. You can do this by clicking on the gears icon and selecting add to/remove from lists. After a while, I had to take a break because I was repeatedly given error messages. The process is a bit time consuming if you’re trying to organize a large number of accounts. I highly recommend creating and adding to lists as you go. To view your lists, click on your icon in the top right corner of the screen. 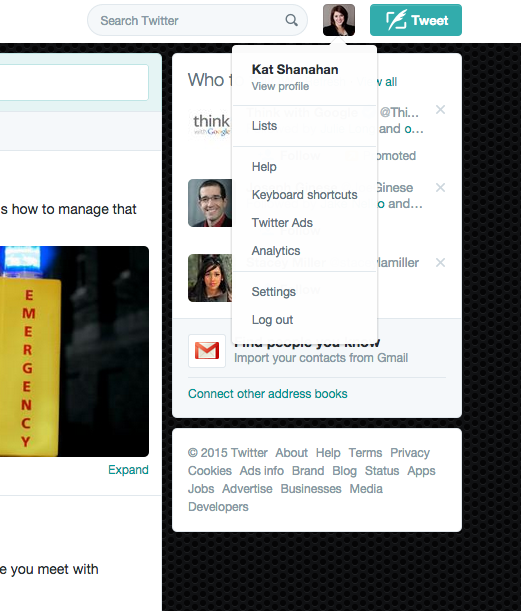 Twitter is a great resource and knowing how to manage it will help you get the most out of your Twitter experience. What are some lists you’ve subscribed to? I use technology every day at work in order to increase productivity in our office. Though it assists us everyday, we use it in conjunction with face-to-face communication – not instead of face-to-face communication. Technology has streamlined our processes and allowed us to spend more time focusing on brainstorming and creativity. Our Graphics & Marketing office has gone through many changes over the last four years. 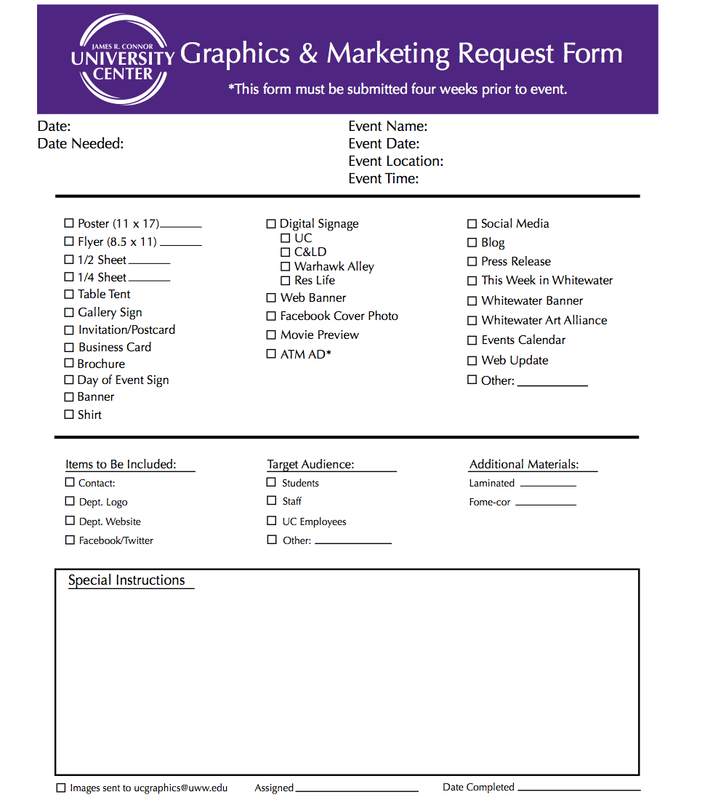 We’ve gone from not having a graphics request form to carbon copy forms, to paper forms, and now we’re digital. We’ve increased the number of graphic request forms by 8% and the number of projects we created by 44% in the last fiscal year alone. These apps are not solely responsible for these increases in productivity, but they have been an instrumental component. Here are just a few of the tools we are currently utilizing in our office to help with productivity. I should mention that we are avid iPad users and lovers! Trello: (I absolutely LOVE this.) After a client and I fill out the form, I take a screenshot and upload it from my iPad into our project management system, Trello. Each student has their own “slot” in the program and we can add “cards” that contain all of the information needed to complete the project. 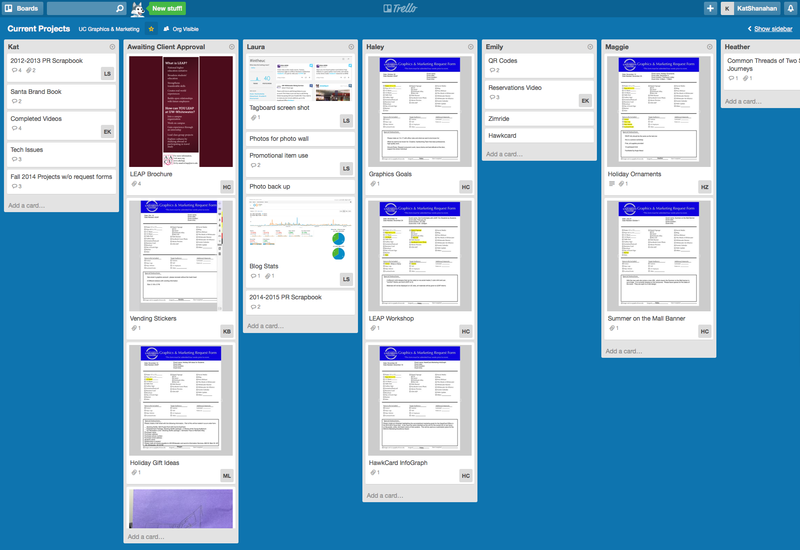 We can assign the project to multiple people, pass “cards” back and forth, and upload documents and revisions to Trello. When students have a draft for me to view they can put the card (with the draft) in my “slot” and I can make comments and return it to them. It saves an enormous amount of time, energy, and confusion for our students. Upside to Trello: FREE apps! 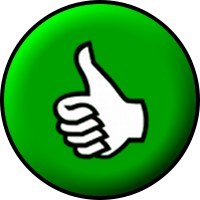 Evernote: I realize this has been around for a while however, I love how easy it is to use. I no longer have to carry around notebooks or file information. I can take notes, minutes, and photos and easily organize them in one area. You can also integrate PenUltimate with Evernote so you can write notes and incorporate them into your Evernote notebooks. Easy Note: This is a great to-do list app. I can write down all of the different things I need to get done and carry them with me all day. You can setup different lists for personal, professional, departmental, etc. It is very easy to use and keeps me very organized. Dropbox: If you’re not using dropbox, sign up now! It is so easy to use and allows for easy document storage and updating. I can access files on my phone, computer, and through the website. Plus, you get additional storage the more you share the program. We use Dropbox to pass large files back and forth between clients and our office to ensure no one is getting upset that their inbox is constantly full. As I mentioned before, technology assists us in our daily tasks, but it doesn’t replace face-to-face communication. We still meet regularly as a staff to build relationships, brainstorm ideas, and discuss projects. These apps are just tools to help keep us organized. Nothing takes the place of good conversation and relationship building. I hope you found some of these apps helpful! As I mentioned, we use a great number of apps in our office, but these are the ones that have been instrumental in our solving some of productivity and communication challenges. Feel free to share some of your favorites in the comments section! DVRs, Hulu Plus, and HBO Go have all made tuning into our favorite TV shows on our own time and without commercial interruptions much easier. Our favorite half-hour sitcoms are now 20 minutes and we can watch a half-hour show and an hour long show in just 60 minutes. Why sit through commercials when you can get 10-20 minutes of your life back? Is there anything that can be done to draw viewers back to watching their favorite shows in real time? It looks like there is. A guilty pleasure TV show of mine recently introduced live polling and voting during their 12th season. Project Runway utilized second-screen interactivity to urge fans to watch the show in real time and vote for their favorite designers, ask audience members if they agree with the judges, and determine who fans thought had the strongest or the weakest design. Many shows, including Project Runway, have tapped into second-screen interactivity by encouraging viewers to use hashtags specifically for the show, vote for contests, and select activities or challenges that would be featured on the show. America’s Next Top Model has a (not very well defined) social media score from viewers that impacts a contest’s chance of winning the contest. Chopped has special episodes in which participants have to create dishes from basket ingredients selected by show viewers, and Bones has a fan of the week that is determined via social media. What makes me wonder about the live polling is what impact it has on the show overall. Live polling allows the producers to see what people are thinking as they watch the show. Do they like a specific designer? What would happen to the viewership if the judgers sent a specific designer home? If you’re familiar with the show you know that host Tim Gunn has a “save” in which he can bring back an eliminated designer. Live polling is a great tool to use in attempting to make decisions based on audience reactions. What do you think? Would you base scripting decisions off of audience feelings, or do you think you would move forward with the show as planned? What else would you do what that audience information? During a recent vacation we encountered an unwanted interruption in the McDonald’s drive-through. Our navigation was interrupted by a McDonald’s ad. Luckily we were at the drive-through and we were not at risk of getting lost, but this wasn’t the first time this has happened. My friend said that he often has troubles with his phone automatically connecting to business WiFi and prompting ads that interrupt the use of his phone even after he set his phone to not automatically connect to WiFi. Simplying driving by business downtown has interrupted his navigation and displayed annoying ads for different products and services. With the phones settings aside, is it acceptable to automatically disrupt what the user is doing in order to display ads from a business that supplies free WiFi? The business is paying for the use of WiFi, so why not? When you check into a hotel, you have to visit a page on the hotel web site in order to agree to terms and conditions before logging onto the internet. Is this different? I would argue yes, because driving by a location that offers free WiFi is enough to prompt an ad. With cell phones, navigation, and other distractions, drivers need to focus on paying attention and not backing out of ads from local business while they’re worrying about where to turn. So, how do you entice people to visit your business and take advantage of the WiFi (and other wonderful products and services)? Oddly enough, McDonald’s also had a very interesting way to solve this problem. McDonld’s has also used WiFi to entice nearby wireless users to stop by and use their WiFi. Brilliant Ads shared the photo below on Twitter. The difference here being that the customer was seeking out the use of WiFi and were encouraged to visit as they tried to connect. I think the second ad campaign is an interesting and unique way to advertise the fact that McDonald’s offers free WiFi and the campaign encourages customers to visit a McDonald’s. I think it also matches the image McDonald’s is trying to create. I remember walking into our local McDonald’s a few years ago and seeing a rage of newspapers offered, updating seating and colors, TV screens showing news stations, and a cozy fireplace instead of outdated booths and ketchup stains. I’m not sure the new restaurant image fits with their food image, but that’s a discussion for another day. The second tactic brings people into the store who are seeking out their services. If driving by and connecting to WiFi is all it takes to disrupt navigation or other cell phone function, shouldn’t businesses be more conscientiousness about this? In my opinion, it only makes the user more irritated and potentially less likely to use their services in the future. What do you think? Have you found these ads to ever be useful? Are there differences between opt-in and auto-generated ads? 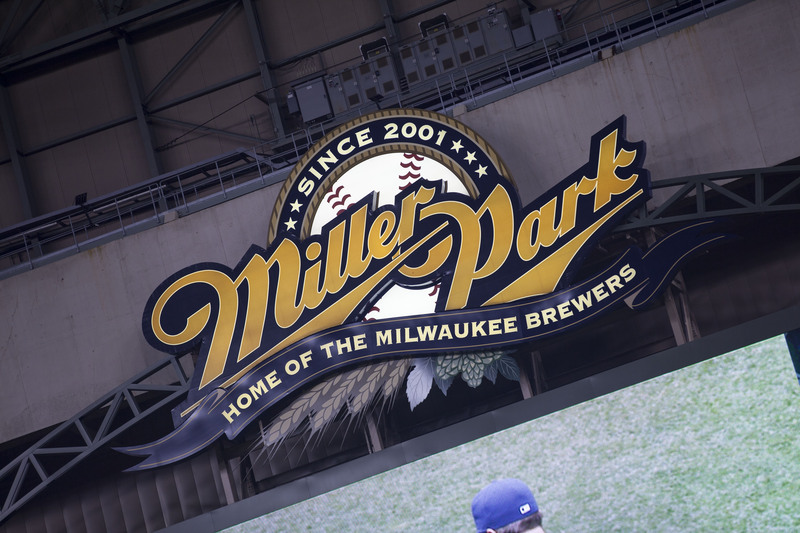 Recently, I had the pleasure of attending a Milwaukee Brewers game at Miller Park. I was thrilled to be back and a little sad that it could possibly be my last game of the season. (I only made it to two games this year, but grad classes will do that!) As I finished up the tailgate and headed for the stadium, I noticed a white furry creature had joined the parade of Famous Racing Sausages headed through the parking lot. I was surprised to see Hank, The Ballpark Pup, marching alongside Chorizo through a field of tailgaters. In case you’ve missed it, the Milwaukee Brewers have added another mascot to their mix. Hank, The Ballpark Pup, first entered the lives of the Milwaukee Brewers at Spring Training this past year. Hank was a stray dog who wandered onto the field and befriended the team while they were in Arizona. Now Hank is a fully signed member of the Milwaukee Brewers, complete with the first Majestic Athletic authentic canine jersey. 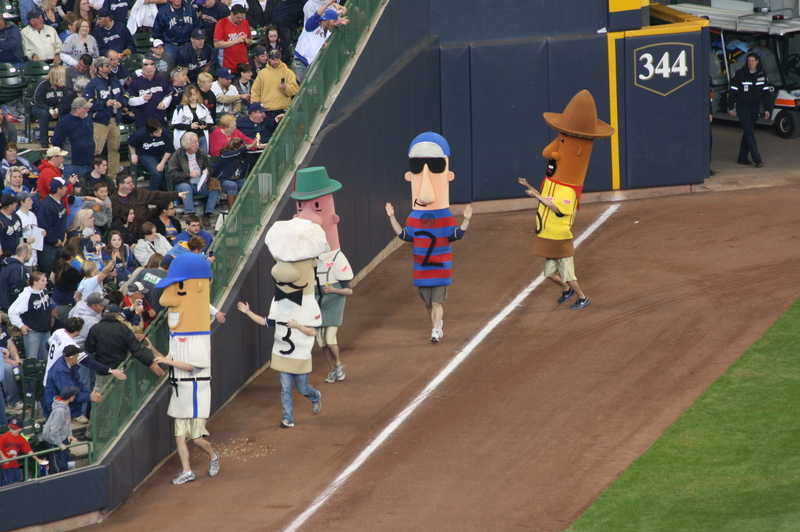 The Milwaukee Brewers have no shortage of mascots running around Miller Park. There are five racing sausages (occasionally mini-sausages as well), Bernie the Brewer (his lady-friend stops by from time-to-time), and now Hank. The marketing and PR challenge of managing that can be exhausting. Not only do you manage the appearance schedules for the players, you have to add seven mascots to the mix as well. Merchandising and appearances have been very lucrative for the Milwaukee Brewers, but is it possible to do too much? Marketing and PR professionals for sports teams need to be concerned with players lives on and off the field (The NFL has learned that the hard way this week), the storyline of the team and mascots, and the overall fan experience. There are not many organizations that can say their loyal customers tattoo logos and team symbols on their bodies. With that loyalty comes great responsibility to the fan base. Adding a new mascot to a mix that has been with the Milwaukee Brewers since the early 90’s has advantages and disadvantages. While a shiny new mascot brings in a new crowd (especially animal lovers) and freshens up the stadium experience, it can leave die-hard fans feeling like adding another mascot is a cheap trick to increase attendance. I believe the benefits of sharing the Hank story outweigh the disadvantages. The story of Hank has resonated with people all over the country and the Brewers are doing great things with that attention. Hank now has his own bobble-head, promotional products, mascot suit, children’s book, t-shirts, and more. Twenty percent of these sales benefit the Wisconsin Humane Society. In a pre-game ceremony on Sept. 13, the Wisconsin Humane Society was presented a check for $130,000 from the Brewers Community Foundation from merchandise sales and other donations. Yes, it’s advantageous for the Brewers because in only the first three months of the baseball season the team sold more than 12,500 K-9 jerseys. (How do you think baseball stars Ryan Braun and Johnathan Lucroy feel about being outsold by a pup?) But, this partnership is also great because it raises awareness for homeless animals in addition to the Wisconsin Humane Society. 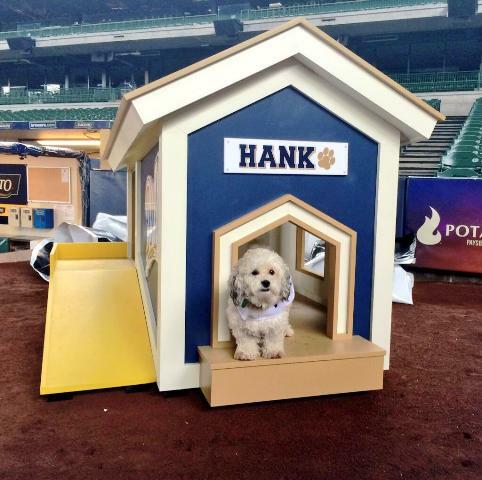 The Milwaukee Brewers have paid close attention to Hank’s endorsements and appearances. They want to focus his engagements on events that benefit a charitable cause or the fans. The Brewers executives want to make sure he’s not exploited and put his health and well-being before appearances. While some could argue that having a dog endorse anything involving baseball could be exploitation, this amazing story happened to the Brewers and Hank’s life is better because of it. Sure, he won’t be around forever and they may eventually retire his mascot suit, but it will forever go down in Brewers history as a significant and life-changing event for all parties involved. What are your thoughts? How many is too many mascots? Have the Brewers added one too many?